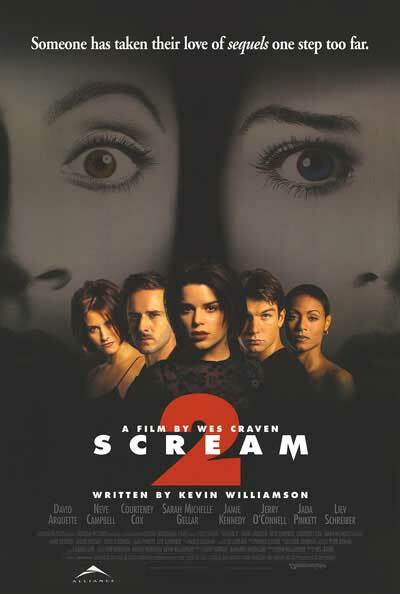 On this week's episode, the gang goes back to Craven Country to discuss the bloated sequel, Scream 2! What's with all the emotional scenes reuniting characters from the first movie? How are we supposed to believe that Laurie Metcalf lifted Jamie Kennedy up off the ground? And why does David Warner insist on this college theater production continue despite the multiple murders? PLUS: Terminator 2: Budnick Day! Scream 2 stars Neve Campbell, Courteney Cox, Laurie Metcalf, Jamie Kennedy, Jerry O'Connell, Timothy Olyphant, Liev Schreiber, Omar Epps, Jada Pinkett Smith, Sarah Michelle Gellar, and Duane Martin; directed by Wes Craven. Be sure to catch our live commentary over I Know What You Did Last Summer, October 27th at the Jacob Burns Film Center's fourth annual Halloween Marathon! Get your tickets here—the early bird passes are still available until 10/18! Join our Patreon for exclusive access to WHM's The Nexus Podcast and Animation Damnation! © 2010 We Hate Movies. Powered by Blogger. The views of the WHM panelists are their own and do not reflect the views of their employers or parent companies.